Autumn used to be my favorite season in Japan because of the beautiful red and orange colours you can find in the trees. My recent trip to Japan made me reconsider my stance, as I feel like I'm discovering the pleasures of viewing the sakura (cherry blossoms) again. 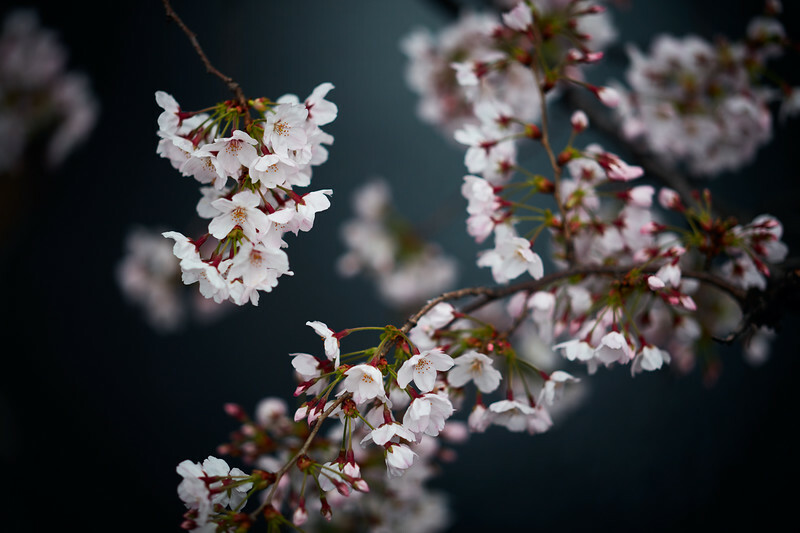 Sakura are immensely difficult to catch at the right time because of their extreme fragility. Not only you have to have the right conditions of temperature to allow them to bloom but they are so fragile that strong winds or rain can easily wash away a large amount of petals, leaving you with only the regret of not having been able to see them and the hope you will be luckier next year. As you may expect, this happens more often than not, especially when the weather is so unstable in spring. This year, I feel I was there exactly at the right time. I had never seen the Someiyoshino trees (the most popular kind in Japan) as pink as that, as far as I can recall. I was even wondering if the pink colour was a myth because I only remembered seeing them in white. This year however, the Gods of sakura were kind to me and allow me to witness the fragile flowers fully bloomed and with that delightful pink tint that fascinates Japanese going out by thousands to see them. In spite of a cloudy weather, I feel the few days I spent in Japan finally fulfilled a quest that I had gone on for 12 years living in Tokyo!